Functioning as the control center of the box designs Series of products, the pre box S allows you to easily switch between multiple inputs while providing high-quality amplification. 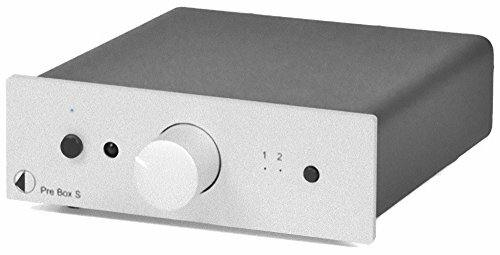 The pre box S was designed to drive the amp box S or two amp box S Mono amplifiers and Features Ultra low-noise IC chips and dual-mono circuitry for exceptional audio fidelity and superior channel separation. The massive metal chassis effectively rejects any external vibration and shields the amplification stages from electromagnetic interference. There is a 12V trigger output to control other components and an IR remote is included to wirelessly switch inputs and adjust the volume potentiometer in real time. The pre box S from Pro-Ject is a simple, high-quality preamplifier made to fit perfectly at the center of your entire box designs system.